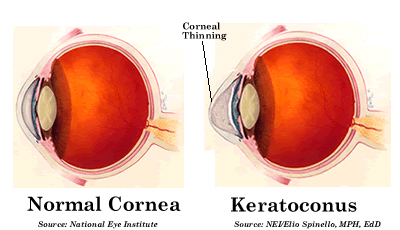 Keratoconus is a non-inflammatory and degenerative eye disorder. It causes progressive thinning of the cornea, which is usually round in the healthy eye, to bulge and become cone-shaped. Symptoms of distorted vision and glare are usually reported due to irregular corneal surface. While the disease progresses, the apex of cornea often develops scar tissue, which further reduce the vision. Keratoconus is found approximately 1 out of every 2,000 people, and there is no significant ethnic, geographical or social pattern established. Genetic predisposition might play a role, but most of keratoconus patients do not show strong hereditary pattern. Most of the patients, however, report history of ocular allergy and/or habit of eye rubbing. Clinically, keratoconus is usually first diagnosed in late teens and continues progressing for the next 10-20 years. The extent of progression varies individually. Both eyes are usually involved, but one eye might be more advanced than the other. Patients with keratoconus will experience progressively worsening in vision with complaint of glare, halo and frequent prescription change. Early detection of keratoconus is important for disease management. Diagnosis of keratoconus is made by clinica’ examination of the cornea, keratometry and computerized mapping of the cornea surface (corneal topography). For early stages of keratoconus, spectacle glasses and soft toric contact lenses might be able to provide acceptable vision. However, as the condition worsens, the most effective treatment is gas permeable contact lenses. Many different special designs of lenses are available to provide functional vision for patients with keratoconus, including specialized RGP, piggy back with soft and RGP lenses, scleral lens (large diameter of RGP) and hybrid contact lenses. SynergEyes ClearKone hybrid lens is FDA approved for treatment of keratoconus. The rigid center of the lens will vault over the irregular corneal surface to create a uniform optical refractive surface to minimize distortion and provide crisp vision; while the soft skirt will prevent lens dislodge and increase stability. ClearKone lenses allow keratoconic patients to see clearly with all-day comfort. The purpose of surgical procedures is to strengthen, flatten or replace the deformed cornea, unfortunately, they will not reverse the process of this disease. With the modern contact lens technology and surgical advancement, most of people with keratoconus are able to enjoy good vision throughout their lives. Collagen crosslinking is a new technique for keratoconus treatment. It was just approved by FDA in April 2012, though it has been practiced in other countries for many years. The goal of collage CXL is to “strengthen” the collagen fibers in the cornea, hence to slow down or prevent the progression of keratoconus. It is not the “cure” of the disease. In most cases, you will still need contact lens and/or glasses after the procedure. INTACS corneal inserts are small semi-circular inserts that are placed in the cornea. They are designed for long-term vision correction. However, INTACS may be removed or replaced with a different size if necessary or desired. The goal of these inserts is to “flatten” the central cornea to reduce vision distortion caused by progression of keratoconus. INTACS can also enhance tolerance of contact lens wear by reducing the protruding conical shape of cornea. Depends on the location and stage of keratoconus, the result might vary. Patients with INTACS implant can still wear contact lenses to optimize vision. Corneal transplant is a surgery that replaces the diseased cornea with a normal cornea from a deceased donor. It is indicated when vision is no longer satisfied with contact lenses due to advanced corneal thinning or dense corneal scar. It is estimated that approximately 20% of patients with keratoconus will have progression to the degree where corneal surgery is necessary. Lamellar corneal transplant is the newer techniques to replace only partial corneal tissue of the diseased cornea to reduce the post-operational tissue rejection. The vast majority of patients will achieve clear vision after transplant. Many patients will still need glasses or contact lenses for optimal vision.